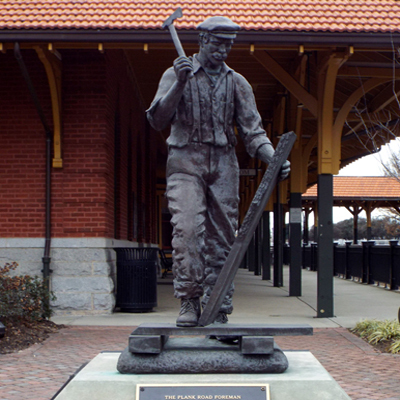 The bronze statue depicts a construction foreman building the 130-mile plank road from Fayetteville to Salem. The mustachioed foreman’s right foot is on a piece of wood, a hatchet raised in his right hand poised to strike a plank held with the left hand. The statue stands on a formed concrete base with sloping sides upon which bronze plaques are attached to three sides. One plaque describes the history represented by the statue, one the sculptors biography and the third one lists major contributors. Plaque, front base: THE PLANK ROAD FOREMAN / THIS STATUE OF A PLANK ROAD FOREMAN IS DEDICATED TO / THE ESTABLISHMENT OF THE CITY OF HIGH POINT AND IN / OF THE MEN AND WOMEN WHO WORKED IN LOCAL / INDUSTRIES AND BUSINESSES THAT MADE IT FAMOUS. IN THE 1840’S AND 1850’S CONSTRUCTION WAS COMMENCED / ON THE 130 MILE PLANK ROAD FROM FAYETTEVILLE TO SALEM. THIS INTERSECTION OF THE FAYETTEVILLE AND WESTERN PLANK / ROAD WITH THE NORTH CAROLINA RAILROAD RESULTED IN / A SETTLEMENT THAT GREW TO BECOME / KNOWN AS HIGH POINT. Plaque, base left side: DAVID A. DOWDY, JR. / THE “PLANK ROAD FOREMAN” WAS THE IDEA, CREATION AND LABOR OF / HIGH POINT NATIVE SON, DAVID A. DOWDY, JR. THROUGH HIS CAREFUL / RESEARCH OF THE ERA IN NORTH CAROLINA’S HISTORY THAT PRODUCED THE PLANK / ROAD, MR. DOWDY HAS SCULPTED A TIMELESS REMINDER OF THE GREAT VISION / SHOWN BY OUR CITY AND STATE IN THIS EARLY EXAMPLE OF ECONOMIC / DEVELOPMENT. COMPLETELY SELF TAUGHT IN THIS MEDIUM OF EXPRESSION, / HIGH POINT’S WIDELY ACCLAIMED SCULPTOR HAS GENEROUSLY CONTRIBUTED TO HIS / HOMETOWN ALL OF THE LABOR AND ARTISTRY FOR THIS MAGNIFICIENT STATUE. IT / NOW BECOMES A PART OF HIS OTHER PUBLIC PIECES WHICH INCLUDE ALEXANDER / GRAHAM BELL IN CHARLOTTE, GEORGE WATTS HILL AT THE UNC ALUMNI / CENTER IN CHAPEL HILL AND SENATOR JESSE HELMS IN THE JESSE HELMS / CENTER AT WINGATE, NC. 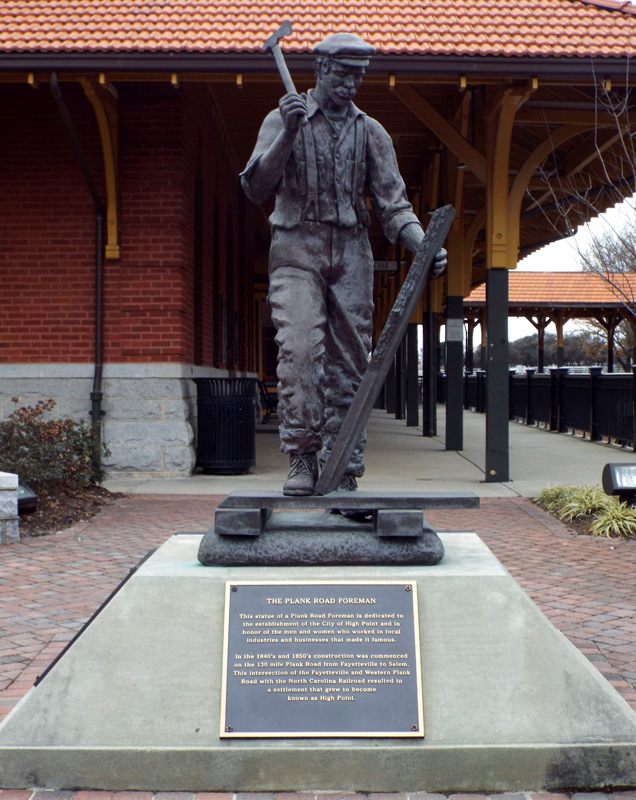 The statue is located on a brick patio outside the restored High Point Train depot on the corner of W. High Street and N. Main Street along with the “High Point” marker. On the corner across E. High Street is a plaque to General Maxwell Reid Thurman. A brick plaza, or, Memorial Park, at the corner of N. Main Street and E. High Avenue, includes several monuments and markers: Veterans Memorial, Revolutionary War Patriots, POW/MIA plaque, African American Gold Star plaque, World War Two Honor Roll, WWI Doughboy statue. Bushes and trees adorn the brick patio outside the restored train depot where the Plank Road Foreman statue stands.